In the much-hyped by-election in the Umarkote Assembly constituency in the Maoist-affected Nabarangpur district held on November 30, the State's ruling Biju Janata Dal (BJD) candidate Subhas Gond won the seat by an impressive margin of votes after the counting of votes on Sunday. The BJD retained the seat, which was held by the party's Jagabandhu Majhi before he was killed by yet unknown assailants on September 24, necessitating the bypoll. The BJD's win assumes significance as the bypoll was held ahead of the panchayat elections slated for February next year. 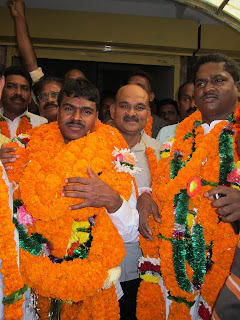 Subhas Gond defeated his nearest BJP rival Dharmu Gond by 21,061 votes, officials said. While he polled 54,713 votes, Dharmu Gond bagged 33,652 votes. Jagabandhu Majhi had won by a margin of about 14,000 votes over Dharmu Gond in 2009. Finishing a close third, Congress nominee Jitendra Gond secured 32,877 votes. "We tried to put our best efforts and improved upon our margin," said local Congress MP Pradeep Majhi, adding, "The Government machinery won the bypoll and this result will have no impact on the ensuing three-tier pachayat polls." The local BJP leaders expressed surprise over the bypoll verdict. BJP candidate Dharmu Gond said that there was every likelihood of the EVMs being tampered. Besides, the ruling party engaged all Government employees, para teachers, Kendu leaf workers, SHGs, ASHAs and Anganwadi workers in the election, he added. On the other hand, the bypoll result brought joy and celebrations among BJD leaders and workers at many places in Nabarangpur town and Umarkote while opposition even as Congress and BJP leaders viewed it as an "outcome of money and muscle power." Nabarangpur district Health care in a shambles. Sargiphool 2011 Organised at Nabarangpur.